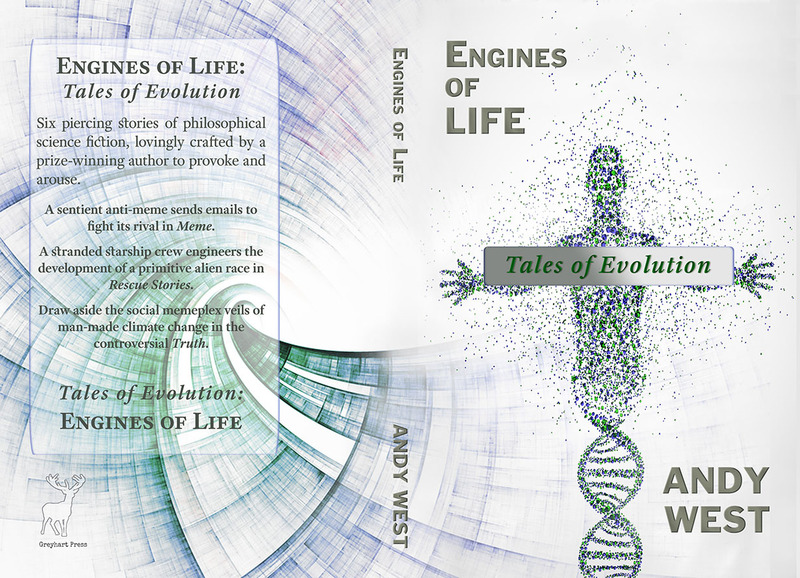 A collection of novelettes and a novella by Andy West with the connecting theme that underlies almost all of his fiction: evolution. Includes several prize-winning stories. Includes Empirical Purple, The Curator, Meme, Rescue Stories, and the controversial story, Truth, which caused a stir when first published on Watts Up With That, the worlds most viewed site on global warming and climate change. Six piercing novellas and novelettes of philosophical science fiction, lovingly crafted by a prize-winning author to provoke and arouse. A sentient anti-meme sends emails to fight its rival in Meme. A stranded starship crew engineers the development of a primitive alien race in Rescue Stories. Draw aside the social memeplex veils of man-made climate change in the controversial Truth. Using hypnosis Professor Merrill probes the ‘proto-Sapiens’ language buried in us all. Yet mining the primitive words unlooses savagery, which kidnaps Merrill into grisly Ritual in Mano Mart. Awaking with amnesia in a sealed, spooky museum, Guy Green seeks identity and escape. He finds a curious alien, a disgusting Curator, and an appalling future. Ofermynd meant only to examine the primitive creatures competing fiercely upon 7th century Earth, not reveal himself. Hearing God’s word, Emperor Heraclius declares Holy War in Empirical Purple. Follow this link to read the press release, which explains some of the thinking behind why we are publishing these stories. This entry was posted in Book launch and tagged andy west, british science fiction, BSFA, cheap kindle book, cli-fi, evolution, hard science fiction, hard science fiction anthology, science fiction. Bookmark the permalink.